Charles had dismissed Parliament in 1629. Deprived of access to legitmate grants of money to fund wars, Charles was obliged to make peace with Spain and France and as a result England sat out most of the rest of the Thirty Years War. The nation’s finances were, however, a mess and Charles was then faced with aÂ desperateÂ need to raiseÂ revenue without reconvening Parliament. To do this he started to impose a variety of taxations that he believed he could get away with or were perhaps in theory legitimate rights of the king. This was a law from 1279. It stated that anyone (knights) who earned £40 or more each year had to be present at the King’s coronation. This law had fallen in to disuse but Charles fined all individuals who had failed to attend his coronation in 1626. This Tax was in theory levied on coastal towns during times of war to pay for building of ships. Charles enforced it throughout the land and during peace time. Each year between 1634 and 1638 this tax brought in around £200,000. This was a deeply unpopular tax and there where legal challenges such as by John Hampden in 1637. However, the courts declared that the tax was within the King’s prerogative. Like Â Elizabeth and James before him Charles sold trade monopolies – bringing in something like £100,000 a year. This was directly in violation of the Monopolies Act of 1624 which James had assented to. 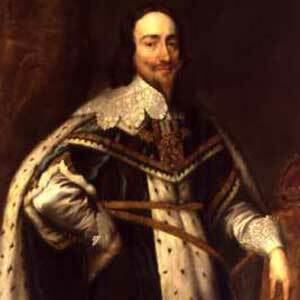 Charles particularly irritated the Scottish nobility by declaring that all existing rights and titles were revoked and only maintained IF the King was paid an annual fee. There were other taxes and obscure laws as well. Charles was in theory within his rights with all the taxes and laws as he was careful to stay within areas that could be considered Royal Prerogative but it was clear that he has put many noses out of joint and that if ever Parliament was recalled he would be in for a bumpy ride. England was still governing Ireland via Lord Deputy appointed by the King. Throughout most of the 1630s this was Thomas Wentworth, future Earl of Stafford. Wentworth had originally been critical of the King but after the King signed the petition of Rights switched sides to strongly support the king. When he did this is was widely accused of having abandoned much of his previous ethics. He would become a strong supporter of the Divine Right of Kings along with Archbishop Laud (see below). Once in post Wentworth pursued an autocratic approach and in effect did his best to suppress Irish aspirations and to impose upon them how he believed the nation should evolve – as a mirror of England. To these ends, and to help raise funds for Charles, Wentworth confiscated the lands of Catholic nobles, opposed steps to grant equality to Catholics and enforced strict economic models that whilst actually helped improved the economy in Ireland were not popular. Overall the result of Wentworth’s government would be an uprising in Ireland. 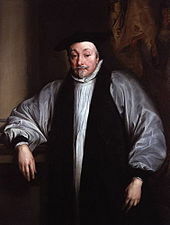 In 1633 Charles appointed as Archbishop, William Laud. Laud believed strongly in the use of sacraments and icons in churches and in the authority of bishops and church hierarchy. This ran in opposition to a strong puritan/calvanist belief amongst many in the country which stressed individual salvation and whose members opposed the authority of bishops and disliked icons – all of which they saw as papist,Â catholicÂ influences. Laud insisted that all services were conducted using the form laid out in the Book of Common Prayer. With Charles’ agreement Laud began using the court of the Star Chamber to put on trial religious dissenters. It had the right to impose severe punishments and even subject the victims to torture. It was a crack down which lead to a fresh wave of emigration to America. In Scotland, Charles took on the Presbyterian church whose members worshipped in independent churches answerable to their own elders and affiliated together but having no Bishops. Charles tried to force upon them a book which was in effect the book of Common prayer as well as trying to bring in bishops. The Presbyterian Scots reacted very negatively and in 1637 there was an uprising sparked off by the first use of the book in church. This revolt took shape under the leadership of the National Covenant – the representatives of the individual churches and this anti Catholic, pro Presbyterian movement – called the Covenanters – were soon the defacto government in Scotland and would play a large role in the Civil War of the next decade. In 1638 the General Assembly of Churches in Scotland abolished Bishops. This was too much for Charles. Charles Â had to try and supress this uprising and in 1639, without calling Parliament, managed to raise a military force and send it north. However, although it was able to recapture Berwick upon Tweed, Charles realised it was not strong enough to actually defeat the Covenanters. The best he could achieve was an agreement where the Covenanter’s government was temporaily dissolved and the Scottish Parliament and Council of Churches called. Charles knew however that the Scots were not likely to alter their stance and so The First Bishop’s war ended with an uneasy truce which both sides knew would not last. If he was to get anywhere with suppressing the Covenanters, Charles needed funds to raise an army big enough for the purpose. He had used up all his options for legal methods of raising cash – and in fact had stretched the law a bit too much. Many members of the commons were puritan and many were affected by his tax raising steps of the Personal Rule. Thus Charles knew that Parliament would be stubborn BUT he had no choice. As the 1640s began and with unrest and dissatisfaction at a high level, Charles was obliged to summon Parliament. Coming Next Week: Its War! Whilst Britain was self absorbed by its own problems the Thirty Years War raged on. 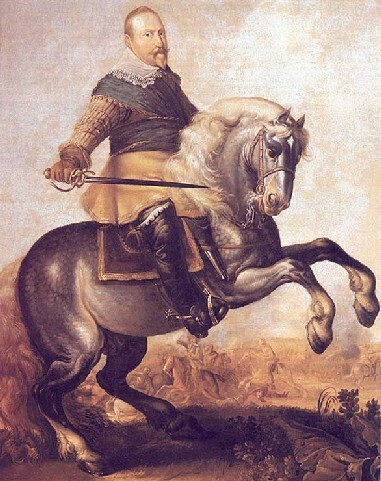 The Swedes, lead by Gustavus Adolphus and probably concerned that their main trading partners – the Protestant German states – were under pressure from the Holy Roman Emperor, joined and championed the Protestant cause and won a series of battles, pushing the Imperialists back until he was finally killed in 1632 at the Battle of Lutzen. In 1635 the Peace of Prague brought to an end conflict between the Protestant Germans and the Empire. The northern states were granted religious independence but agreed to the overlord-ship of the Emperor. Sweden did not accept the Peace of Prague and fought on. France, a catholic country, decided to back the Swedes mainly in an attempt to cut down on the power of the Spanish Hapsburgs which of course included the Holy Roman Emperor who had gained from the Peace of Prague. So the war continued at the end of the decade. 1630: Native Americans introduce popcorn to the English settlements. 1631: Algerian Pirates attack Cork, Ireland. 1635: The Japanese Emperor closes Japan’s borders. Europeans landing would be beheaded. 1637: Tulipmania in Holland. Prices of Tulips sore to vast levels. Eventually like the DOTCOM episode the bubble bursts.